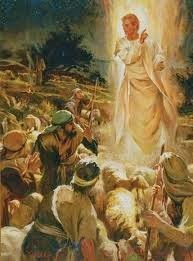 The angel Gabriel had appeared to two people, Zacharias and Mary, and an angel appeared to Joseph. If you would like to read last week’s lesson, click here. Angels are a vital part of the Christmas events. I’ll tell you more about angels in a while. But first, let’s continue on with our story. Joseph has just been told to take Mary as his wife. So, they got married. I bet they were both happy. During this time the ruler, Caesar Augustus, wanted to know how many people lived in all of his provinces. He desired a good count, so he could tax them for more money. To get an accurate number, he had all the families go to the town where their ancestors were from. Joseph and Mary were from the line of David. King David was born in Bethlehem. Mary and Joseph needed to travel there to be counted. They had to go about 70 miles. At that time, there were no cars, busses, trains, or airplanes. They had to travel on foot, horse, camel, or donkey. Well, Joseph was not wealthy, so all he could afford was a donkey. Mary rode on the donkey’s back while Joseph walked. This walk was long and difficult. The area had mountains and was rugged. Mary was also expecting baby Jesus. “No room,” was the reply. 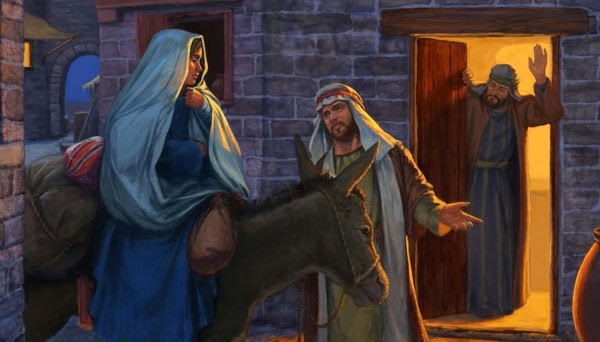 Joseph kept knocking on doors until one kind innkeeper told them they could sleep out with the animals in the stable. Can you imagine how discouraged he felt? Here was his new wife whom he loved, ready to give birth, and all he could give her was the stable to sleep in. The stable was the place where animals ate and bedded down for the night. It smelled. He got some clean straw and made the place as comfortable as possible. He tenderly helped her off the donkey and settled her on the straw. They were grateful to have some shelter. On a hillside not far away there were shepherds watching their flock. Sheep need a shepherd to protect them from wandering off and from wild animals. That night when all was quiet, a bright light appeared, and so did an angel. Those shepherds were afraid! Can you imagine? And behold, an angel of the Lord stood before them, and the glory of the Lord shone around them, and they were greatly afraid. Then the angel said to them, “Do not be afraid, for behold, I bring you good tidings of great joy which will be to all people. 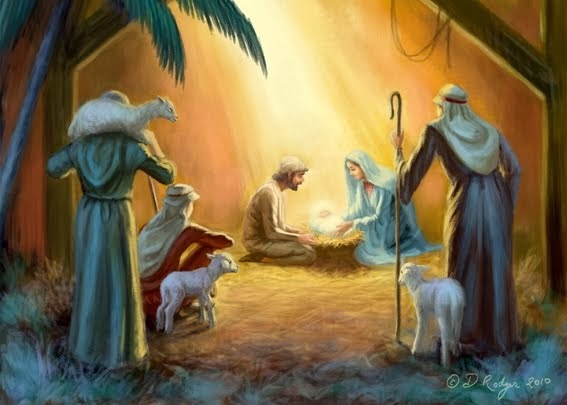 For there is born to you this day in the city of David a Savior, who is Christ the Lord. And this will be the sign to you: You will find a Babe wrapped in swaddling cloths, lying in a manger.” And suddenly there was with the angel a multitude of the heavenly host praising God and saying: “Glory to God in the highest, And on earth peace, goodwill toward men!” Luke 2:9-14. Wow! 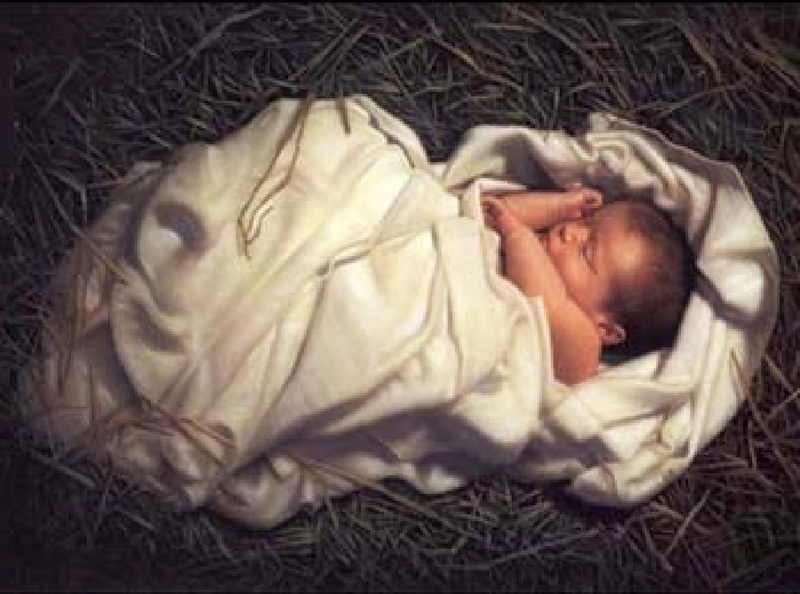 God’s Son, Jesus Christ, was born! Shout it to all who will hear! The promised Messiah finally came. The shepherds wanted to see the babe, so they went to the stable. I’m sure you have seen a nativity. A nativity is a display of statues or people showing what it may have looked like when Jesus was born. Mary thought about all of it. I wonder just what she thought. The Bible says in verse 19: But Mary kept all these things and pondered them in her heart. There is more to come in the real Christmas story in our next lesson.